The approach requires minimal programming – you work with DeviceSpy (or something equivalent), issue a command, get the returned XML, and transform it. (If you need info on DeviceSpy see the Exploring Sonos via UPnP.) This approach is discussed in detail below. 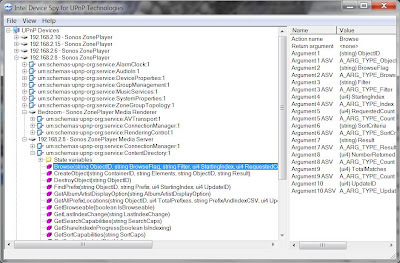 This is a C# program running on Windows 7/8 which can extract one or many playlists. It can also import into a playlist. 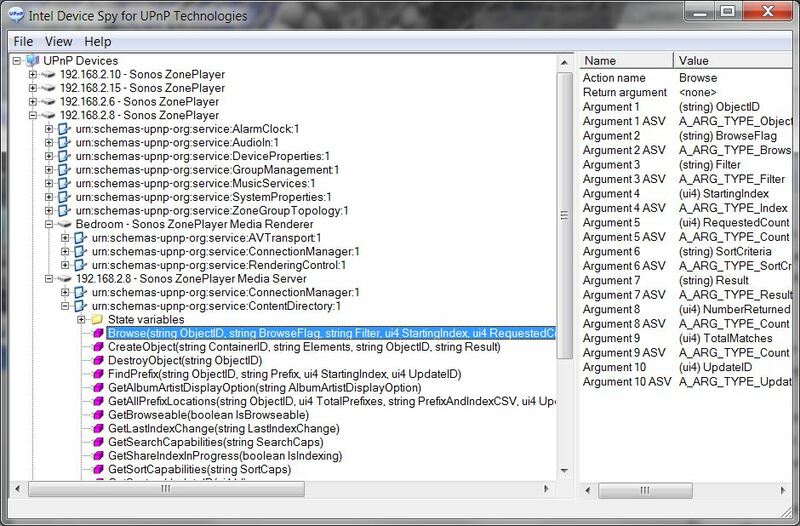 This approach is discussed here: WPF Application to Save and Import Sonos Playlists. **update: Maybe easier is to just create a group of one zone and work with that then you are assured it is the master. 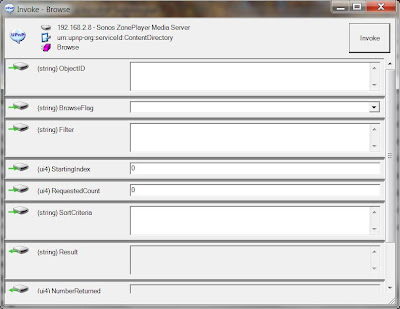 Step 2: In DeviceSpy, go to a zone master expand the Media Server Device, and expand the Content Directory Service. Step 3: Open (double click or right Invoke Action) the Browse Action. Step 4: Fill in the parameters in the Browse Action as shown in each query below. The queries end with Query 6 which is what we really want, displaying what’s in a playlist. In each query, you fill in the fields as shown and hit Invoke and the results will be in the Result field as XML. For now you can post the XML in Notepad to get a sense of what it contains. To get the XML from the Result field to the clipboard place your cursor in the field and CTRL + A to select all. The following example below shows some XML from the Results field. The XML shows one track coming from Rhapsody and one from a local server called mediaserver. 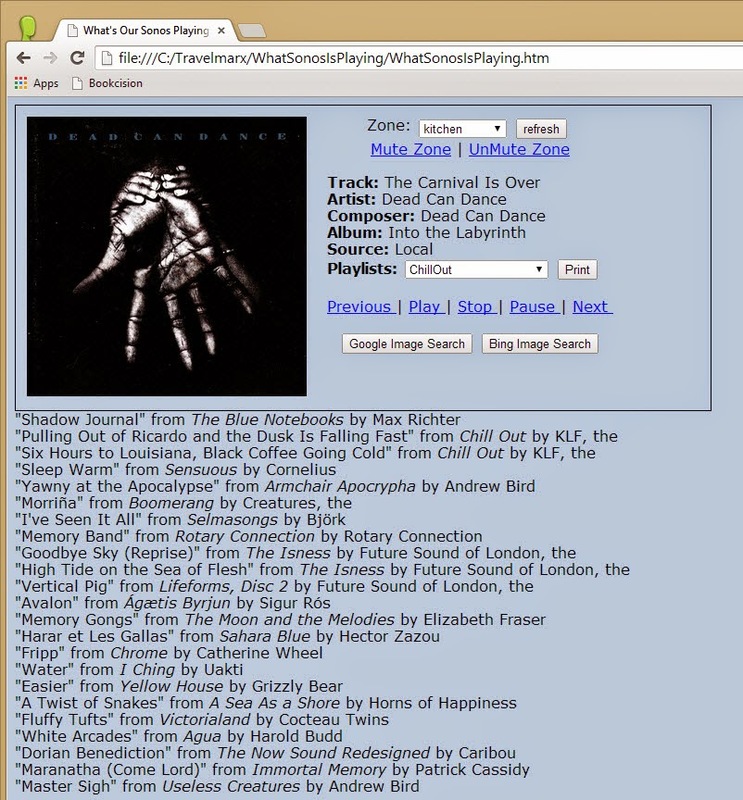 Step 6: Take the XML from the last request (a particular saved queue) and put in a file called playlist.xml. Step 7: Create a XSLT file in the same location as the XML file. Call it transform.xslt. You can create a text document and change the extension to .xslt. The XML the query returned is DIDL which stands for Digital Item Declaration Language and is an XML dialect for MPEG-21. In the XLST file you have to be sure and use the namespace declarations carefully. The XML file has xmlns="urn:schemas-upnp-org:metadata-1-0/DIDL-Lite/" so we have to use that in XSLT as well. In the XLST we define it as xmlns:didl="urn:schemas-upnp-org:metadata-1-0/DIDL-Lite/" using a prefix of “didl”. In this example we use the browser (verified in Internet Explorer 9 and Chrome) to do the transform. 1. Populate a drop down list with defined playlists. Uses Query 5 above. 2. Create two buttons next to playlist drop down list. Uses Query 6 above. One button shows the playlist items in the page and the other to copy the playlist to the clipboard. (Since we are stuck with Internet Explorer, we went ahead and used the clipboardData object. 3. Automatically change the zone drop down to the master zone - was a manual process in the previous version. An example of the page output is shown below. Get the code from GitHub. The Picasso in Seattle exhibit (October 8, 2010 – January 17, 2011) at the Seattle Art Museum (SAM) is based on works from the collection of the Musée National Picasso, Paris. That museum is under rennovation and so the works hit the road. The exhibit at SAM includes over 150 paintings, sculptures, drawings, prints, and photographs from the artist’s personal collection. From Wikipedia: “Since Picasso left no will, his death duties (estate tax) to the French state were paid in the form of his works and others from his collection. These works form the core of the immense and representative collection of the Musée Picasso in Paris.” Mon dieu, estate taxes! And, since the work is from his private collection the idea is that it represents what Picasso wanted to use to shape his legacy. First and foremost, props to SAM for putting on a good show. We thoroughly enjoyed it. It was crowded and could have used more breathing room, but lots of people seeing the show is good for the museum. The selection of works was great, the layout of them (more or less chronologically) made sense, and the supporting material (printed and audio) was appreciated. 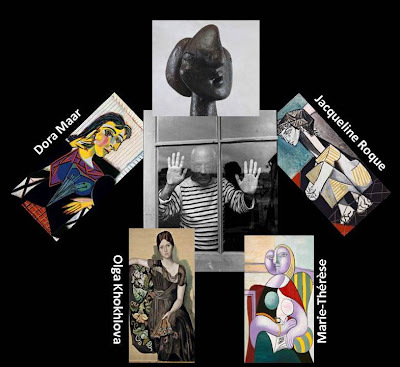 In regard to latter, the museum did an excellent job of making it all available on the http://www.picassoinseattle.org/ web site with the actual labels on the works, a sampling of the art exhibited, the FULL audio tour, and the script to the audio tour. Wow. This is is important because much of our processing of what we see happens after the visit and having these materials available is great for the digital pack rats that we are. And, if you brought a phone capable of browsing and playing the MP3s or podcasts you could use that instead of the audioplayer they handed out (which was prefectly fine too).